MyPhotoSweeper is a powerful software that allows you to find duplicate photos on your computer quickly and easily in a friendly step by step wizard interface. Duplicate photos can take a lot of your hard disk space and also slow down your PC. Why waste your precious time looking for each duplicate photo manually. With MyPhotoSweeper, it helps you to simplify the process to find all duplicate photos in a folder and its sub folders, computer or network and organize them according to duplicate groups. 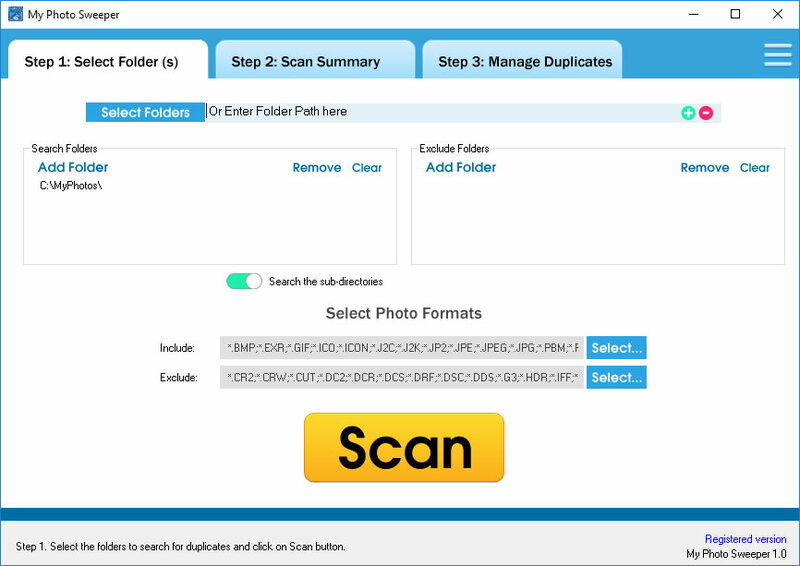 Once the scan is complete, the matching images are displayed in groups along with the summary report like total duplicates, total groups, space used and etc. There is a handy preview feature that lets you quickly preview each of the duplicate photos before you take any action. Available actions include sending the duplicate photo to recycle bin, permanently delete, move, copy, rename, and export the result to clipboard or as a text file. Comprehensive report for the search summary, including the total duplicates, space used, duplicate group, files found and etc. Delete duplicate photos permanently, send to recycle bin, rename, copy, move, and export the result to clipboard or as a text file. I love MyPhotoSweeper! Are there any new major features planned for the near future btw?